This is cool. As I've written in the past, I have a soft spot for the European Capri. I once had a girlfriend who owned one and I drove it quite a bit. It was a fun car to drive. This is a 1976 Mercury Capri Rokstock RSR Turbo. 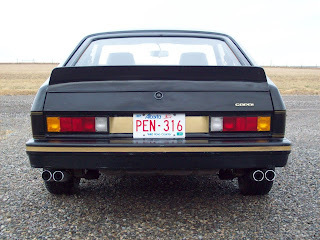 It is a 1976 Mercury Capri (But seeing as I am English I prefer to say Ford) 2.8 V6 Black Cat model, which in many respects is the same as the UK version that was called the John Player Special (JPS). This is the MK2 version of the Capri that was sold here in North America. This car was modified by an independent of Ford company called Rokstock back in 1980. Rokstock was owned and run by Richard O'Kiser, a well known engine tuner in the 70's and 80's. He offered a full tuning package for the MK2 V6 Capri that would turn your run of the mill Capri into a highly capable race track weapon. The obvious additions to the standard car is the fitment of the turbocharger to boost the power to 180BHP(65% increase over standard) but under the surface the improvements continued! The suspension has been lowered and stiffened and an additional axle locator fitted to the rear. 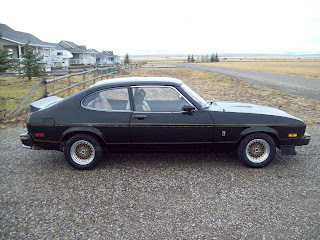 I have owned several Capri's including a 2.8i and the RSR handles like it is on rails. The Capri was a really good car that never sold very well in the US. Ford never spent much time or money promoting it, especially after they introduced the Mustang II. In many ways the Capri was the "Mustang" of Europe. In almost every way, especially in V6 form, it was twice the car the Mustang II ever dreamed of being. After doing some research, the seller believes there were 35 of these cars made. He knows of only two others in existence today. He also states that the odometer shows the car having only 39,000 miles on it. He writes "I am unsure whether this is genuine, however the way it drives, shifts and sounds I would not be surprised if this is correct." Given that this car is from Canada and that Capris rusted as badly as any 1970s car, I, too, would suspect that mileage is correct. This car sounds like it's a blast to drive. If I bought it I'd probably double its mileage in a year. Located in Granum, AB, Canada, click here to see the eBay listing. 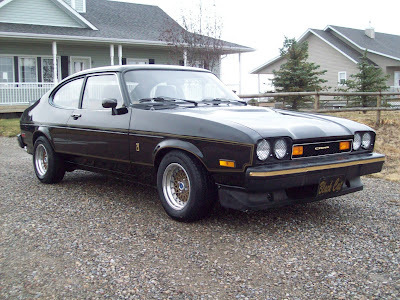 I had a '77 Capri II in the early 80's...Silver/Black Cologne V6 4 Speed... LOVED that car... One of the ones I wish I'd held onto..